The column is composed of a portal-frame of Aluminum profiles JZ 1280 with double guidance rails, Which together constitute a stiff and sturdy frame work. Mobile on 4 casters with brakes and 4 levelling feet to level out exactly and to fix. DIMENSIONS REPRODUCTION-COLUMN 1528 x 1000 x height 3200 mm. 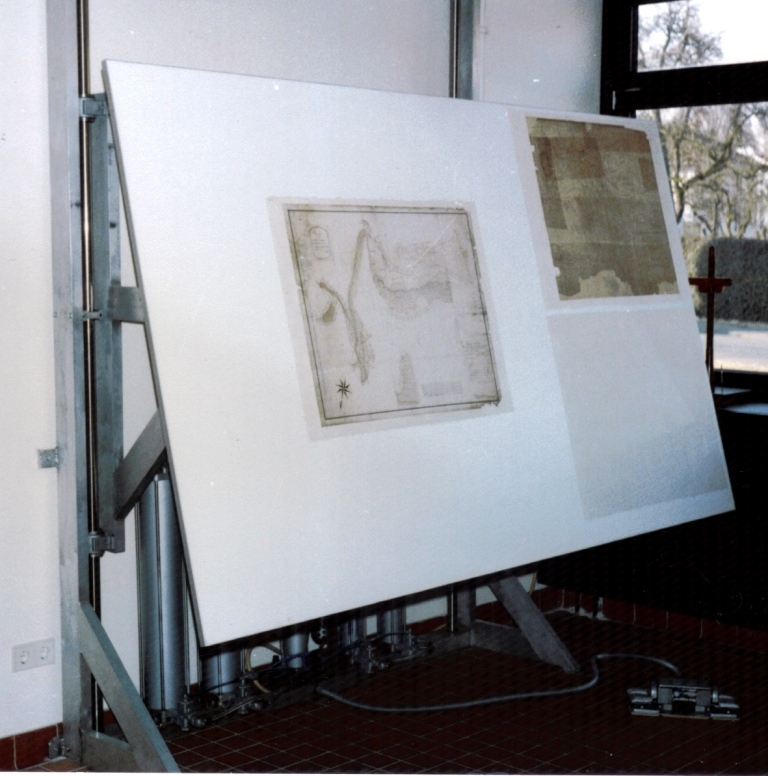 The objects can be fixed on a SUCTION TABLE also mounted on both sides to two runners can run stepless on rails of the portal-frame up to 2800 mm. and down to 100 mm. by means of counterweights and an electric hoist device and also be fixed in any position The suction table is executed with 4 light units for excellent lightning in any position. DOUBLE FUNCTION TABLETOP with a rear part of Trespa and a front part of perforated surface of stainless steel. The dimensions of the useful surfaces are a work area 1200 x 600 mm and the extraction section of 1200 x 400 mm. COMPOSED SUB-FRAME, A base frame on 4 castors with brakes, on which are mounted 2 heavy. 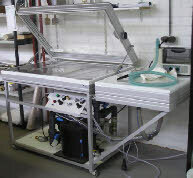 electrically powered Linear actuators carrying the frame with electronics and move the worktop stepless up and down, between 750 and 1150 mm height. 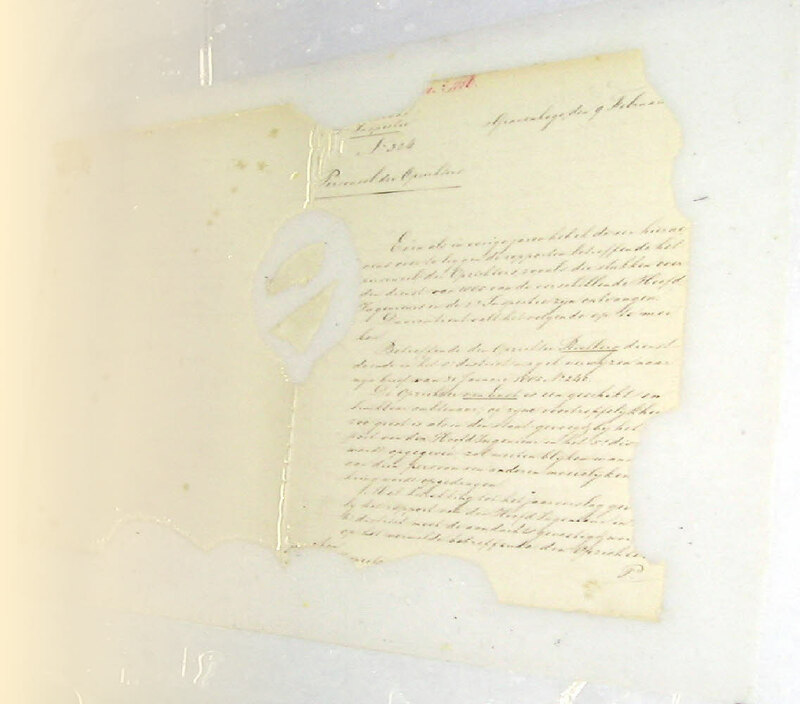 A BLOWING FORK for cleaning the negatives. Air connection with pressure control and air filter to the dense side. 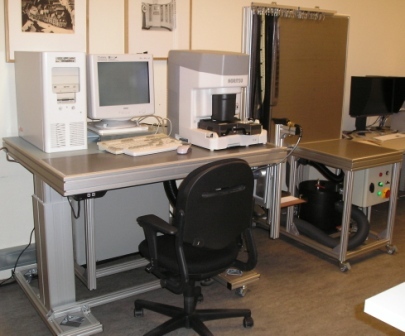 The fork is mounted on an aluminum profile on the scan table and is stepless adjustable front/rear + up/down. JEZET MANOEUVRABLE TABLE SMWTTUF3015 specially made for the relining of the linen backside of old military ordnance-maps. A composed frame of rectangular Aluminium profiles with two linear conductor-shafts for an uncomplicated up- and downwards movement of the revolving tabletop, provided of a 115° revolving-unit. The worktop 3000 X 1500 mm. of softline profile JZ 1200 and a working surface made of hard wearing Trespa, is revolving from an under angle of 15 - 20° till completely horizontal and can be adjusted in any position. At the same time in the way up and down, by means of the foot pedals pneumatic operating system for hands-free working. The table top can also be executed with silicone rubber surface or as a VACUUM TABLE or a LIGHT TABLE. The LIGHT/SUCTION TABLE-TOP is executed with two compartments: 1 for vacuum and 1 for light.the vacuum compartment made of transparent polycarbonate The working surface is made of WHITE POLYETHELENE. The light compartment contains MULTY LEDS of the COLD light 5.000 Lux. Day-light colour. On-off switch and DIMM switch The size of the useful working surface of the table-top W x D 600 X 800 mm. The system consists of 4 compartments and are each divided by 7 shelves. The whole is totally built from softline profiles JZ400 and plates of 2 mm of mat anodized aluminum. The shelves of anodized Aluminum plate and step less adjustable in height and can also be placed slightly sloping back. 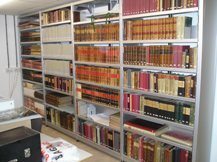 Each shelve is with book load 50 mm extendable to easy and safe handling of the books The total height 2150 mm and the overall width 3900 mm. WORK TABLE WITH SUCTION FOR PROCESSING OF SOLVENTS consisting of: A tabletop of a porous work surface of STAINLESS STEEL on a frame of Aluminum profiles on 4 castors of which the front have brakes. 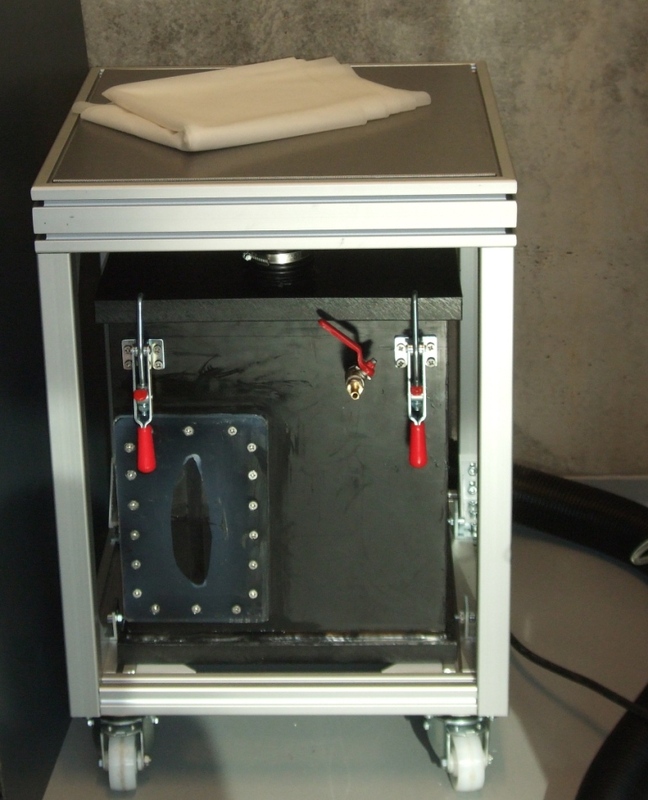 On the bottom-mounted base plate is mounted a trap tank with connection hose to a suction device. The dimensions of the useful surface of SUCTION table B x D = 500 x 500 mm. The LIGHT SUCTION TABLE/WALL is composed in two compartments: 1 for vacuum and 1 for light. 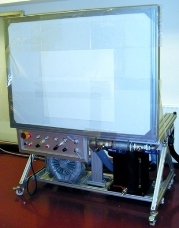 The vacuum compartment made of transparent polycarbonate and a rigid support platform The working surface is made of hard wearing, easy to clean non corrosive, WHITE POLYETHELENE. The light compartment is made of an Aluminium base plate and MULTY LEDS of Intensity of the COLD light 5.000 Lux. Day-light colour. The size of the useful working surface of the table-top W x D 1.500 X 1.200 mm. The SUPPORT FRAME is constructed of a base frame provided with four casters with brakes. Mounted on the frame 2 linear actuators for stepless movement from up to 1150 and down to 750 mm. On the actuators is mounted a top frame to support the LIGHT VACUUM TABLE/SUCTION WALL and enables it to tilt from HORIZONTAL to VERTICAL by means of 4 hinges on the front and a linear actuator. Further on the base frame the ELECTRIC SUCTION DEVICE, PNEUMATIC VACUUM DEVICE, TRAPTANK, CONTROLEPANEL, CONTROLEBOX and connections. Outside dimensions B X D X H = 3790 x 1150 x 1160 mm. of this so called drawer-island and is constructed from aluminum profiles 40 x 40 mm with Aluminum plating of 1.5 mm. The reinforced top is executed with a grey TRESPA plate of 10 thickness. 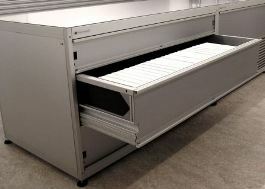 The drawers are provided with a heavy duty multiply wheels system with anti-dump profile. Each drawer is extendable on both sides to 700 mm and equipped on both sides of a continuous handgrip and each can carry a weight of 300 Kg.